CORVALLIS, Ore. – Lawns languish in the heat of summer unless showered with the water they require to thrive. But not to worry, the grass isn’t dead. Come fall when the rains start again, grass greens up quickly, said Alec Kowalewski, turf specialist for Oregon State University’s Extension Service. While letting your lawn go dormant in summer isn’t a bad thing – especially with concern about water shortages – lack of irrigation does allow pesky weeds to gain a foothold, he said. And regular wear and tear can cause compaction within a lawn, which leads to brown or bare spots. Now is a good time to whip your lawn back into shape, but starting over usually isn’t necessary. What you have to begin with can vary from addressing a few brown spots to a desert of weeds to hardpan soil. Assess your lawn’s level of neediness and then proceed with a regular renovation or a no-holds-barred one. Most often, a regular tuneup is all that’s needed. 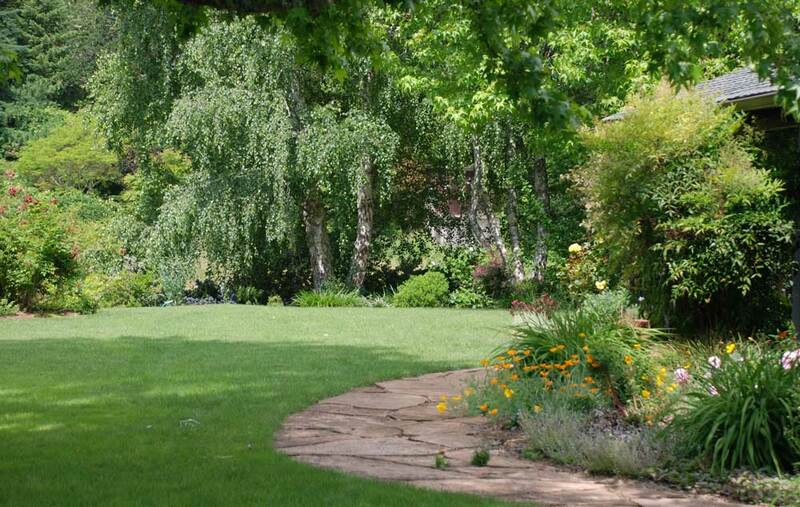 Once you’ve got your lawn established, follow Kowalewski’s three steps to a healthy lawn that will outcompete those pesky weeds: water, fertilize and mow properly. Watering is a matter of 1 inch a week, but don’t do it all at once. Fertilize four times a year. An easy way to remember is to apply on Memorial Day, Fourth of July, Labor Day and Thanksgiving. When it comes to mowing, never remove more than one-third of the grass at one time. That means if the lawn is 3 inches long, cut only 1 inch. Cutting more than one-third weakens the lawn, leaving it vulnerable to weeds and diseases. For most grasses, 2 inches is about top range of what a homeowner will tolerate, but higher is even better. Mow once a week in spring and fall, less often during summer and winter months. Instead of bagging up clippings, consider leaving them where they fall. They break down quickly and resupply much-needed nitrogen. The more often you mow, the easier this is to do. Don’t, however, leave clumps of clippings sitting on the lawn. For more information, watch Kowalewski’s video Integrated Pest Management for Turfgrass. Or check out the following publications: Practical Lawn Establishment and Renovation, Practical Lawn Care for Western Oregon, Retail Lawn Seed Mixtures for Western Oregon and Western Washington and Fertilizing Lawn. Do a pH test. Either take a sample with help from Extension’s Guide to Collecting Soil Samples for Farms and Gardens and send it to a soil lab, or buy a test kit at the nursery. Lawns grow well in a pH of 6 to 6.5. Remove weeds by hand or with a broad spectrum herbicide. Aerate lawn with a machine available at rental shops. Pay particular attention to bare spots or compacted areas. Rake off plugs of soil removed by aerator. If the pH is on the low side (below 6.0), add lime. It’s common in western Oregon for lawns to need lime every two to three years. Fertilize with a product that has plenty of nitrogen, low or no phosphorus and a medium level of potassium. Check the fertilizer label and choose something with a high first number (N), low second number (P) and medium third number (K) such as 20-2-6. You’ll get best results using a rotary spreader. Overseed at the recommended rate, going a little thicker on really bare spots. Use a drop seeder for even distribution. Water daily unless it rains. Mow lawn as short as possible before getting started. Before aerating, dethatch the lawn with a dethatching machine or power rake, which you can rent. The idea is to expose as much soil as possible. Run the machine across the lawn twice, in opposite directions. Remove loosened thatch before changing direction. After seeding, mulch with a thin layer of sawdust, bark dust or compost. A quarter inch is enough; don’t overdo it or seed will have a tough time germinating.